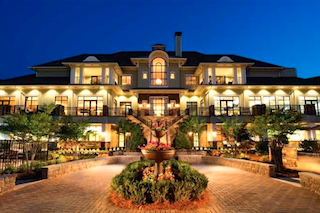 Cresswind at Lake Lanier boasts an amazing clubhouse full of resort-style amenities and high-end features. Opened in 2007, Cresswind at Lake Lanier is a popular Northern Georgia community which will one day include 934 single-family homes designed for active adults aged 55 or better. This gated community also features a 36,000 square-foot clubhouse, a marina with boat slips and a wide range of additional indoor and outdoor amenities. Cresswind at Lake Lanier is located in Gainesville, Georgia, on the shores of one of the state's largest recreational lakes. Lake Lanier is a navigable lake which features 692 miles of shoreline stretching past picnic areas, parks and campgrounds. In Cresswind at Lake Lanier, residents can enjoy boating on the lake, purchase a boat slip at the community dock and make use of the conveniences at the on-site marina. Beyond the navigable lake, amenities in Cresswind at Lake Lanier are largely centered around the community's 36,000 square-foot clubhouse. This three-story facility supports a healthy, active lifestyle for Cresswind residents. The state-of-the-art fitness center offers cardiovascular and strength-training equipment, as well as an aerobics and dance studio, and an indoor swimming pool and spa area. Hobby and game rooms at the clubhouse bring residents together with billiards, cards and other popular pastimes. Additional areas for socializing include the elegant library, the Sidney Lounge and a spacious ballroom for community parties, events and activities. Residents can exercise their minds in the Learning Center, express their creativity in the art room and share their love of cooking in the demonstration kitchen. 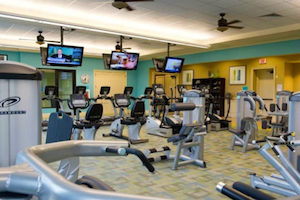 A state-of-the-art fitness center offers residents the latest cardiovascular and weight-training equipment. The Cresswind clubhouse is an ideal place for residents to meet with social clubs and special-interest groups. These groups center around popular topics such as book discussion, computers, cooking, fitness, fishing, games, line dancing, music, sports and travel. Outdoors, Cresswind at Lake Lanier makes it easy for residents to enjoy the scenic grounds and warm Georgia weather. The clubhouse features a spacious terrace, as well as an outdoor kitchen and fireplace. The lagoon-style pool lets residents cool off with a swim or relax with friends on the surrounding sundeck. Sports-minded residents can also enjoy activities like tennis, pickleball, bocce ball and horseshoes. The community's scenic grounds have walking and biking trails, a playground for grandkids, an outdoor amphitheater and an overlook pavilion with a cabana bar. In addition to its navigable lake, Cresswind at Lake Lanier also includes scenic lakes for fishing. Active adults who decide to settle in Cresswind at Lake Lanier can choose from beautiful single-family homes in sizes ranging from 1,346 to over 2,600 square feet. With appealing homes, popular amenities and scenic grounds, it's easy to see why Cresswind at Lake Lanier is a popular retreat for active adult retirees.